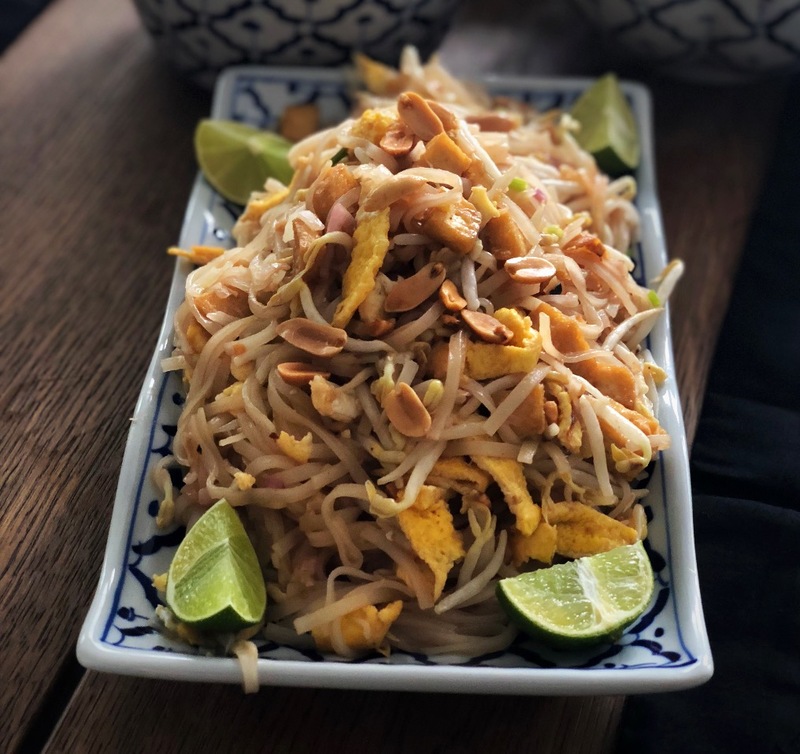 Pad Thai is a delicious stir fry rice noodle dish. I love it. 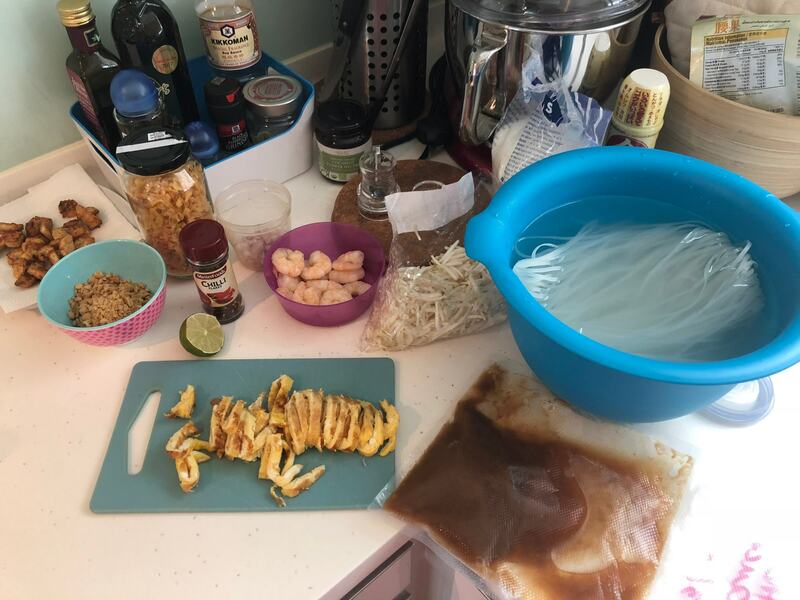 And I tried (and failed) so many times to reproduce it at home, that I was almost giving up.. Until I went to a cooking class and finally I understood the secrets of a juicy (but not oily) fragrant home made Pad Thai. This dish requires a long preparation, you will need to chop, fry, cut, cook and soak.. But when everything is ready, it will only take you 5 minutes to whip up this gorgeous meal! Yes, I know, that is quite a list, isn’t it?? But well worth it, I promise! As usual I listed all the ingredients “in order of appearance” so it’s easier to follow. 1. Grab your rice noodles and check the cooking method. Now forget about it as most of the time it’s not what we need for making pad thai! Get a big bowl and fill it with water. Soak the rice noodles in it for approximately 1 hour or until they are flexible and soft (you should be able to bend them without breaking them and they should be soft enough for you to bite them, like regular pasta). 2. 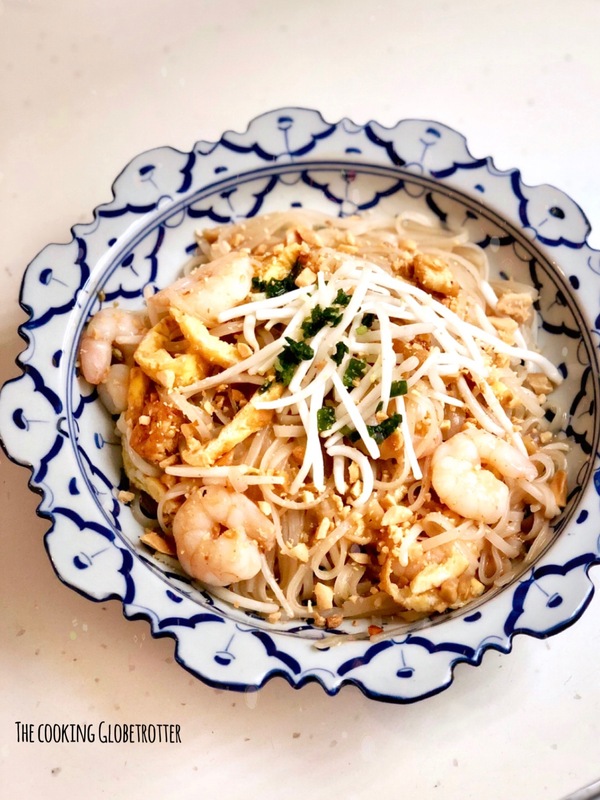 While the noodles are soaking, prepare the very important pad thai sauce. This is key to a good and not greasy Pad Thai. If you were able to find a good quality Tamarind juice (made of Tamarind and water, nothing else) then go for it. Otherwise buy Tamarind Paste and soak it in water (1 liter : 400 g of Tamarind Paste), squeeze it and strain it (yes, I know, doesn’t look that lovely..). Take 250 ml of the juice (you can freeze the rest), add 80 g of palm sugar and 30 g of fish sauce (if you don’t like the fish taste, use light soy sauce instead). Bring to a boil. Let it simmer for about 30 minutes, until it becomes darker and thicker. Then let it cool down. 3. Ok, now let’s move on to the preparation of the other ingredients. You can basically use the wok for everything, one thing after the other. Cut the Tofu (100g firm) in cubes and deep fry them until crunchy. Set aside on some kitchen paper. 4. Clean the (12) prawns and fry them with some oil. Set them aside. 5. Slightly beat the 2 eggs with salt, pepper and a splash of fish sauce and cook them like a thin omelette. Roll it and slice it. Set aside. 6. Chop 1 garlic clove and 1 shallot finely. Chop the chives. 7. Clean and rinse the bean sprouts (150g). 8. Chop (or smash) the peanuts (4 TBS). 9. Cut the lime in quarters. 10. Now, check the noodle, if it’s soft, drain the water, but keep about 1 cup of it for cooking. 11. Ok, the preparation is done! Now it’s time to put it all together! Line up all your ingredients. Pour about 4 TBS of coconut oil in the wok and heat it up. 12. Fry the garlic and shallot until fragrant. 13. Add the preserved radish (1 TBS) if you have it, otherwise omit. 14. Pour the rice noodle, previously soaked in water, in the pan with some of the water and move it around. 15. Reduce the heat. Add the pad thai sauce (250 g of tamarind juice with fish sauce and palm sugar) prepared previously. Mix all together. Add water if it seems to be too dry. 16. Add the other ingredients one after the other and mix them well. Prawns, eggs, chives (1 TBS), bean sprouts (100g) , peanuts (2 TBS) and chilli flakes (to taste). 17. Plate and garnish with the remaining bean sprouts, peanuts and chives. Place the limes on the side. For a complete feast, try also my other thai recipes!